You don’t have to stop eating out just because you’re following a nutrition program. See how we still eat out while following Transform :20. I usually cook Sunday – Wednesday. On Thursday night we have leftovers. Then on Friday & Saturday we eat out. And yes, we even eat out while following fitness plans like Transform :20. The key is planning ahead and being prepared. Before you eat out you should figure out what containers you have for the meal you’re going to eat out. You can even move some containers around. For example if you know you’re going to a Mexican restaurant and can’t eat Fajitas without cheese or guac then be sure to save your blue container for that meal. Now you don’t have to be that person that whips out their containers at the restaurant dinner table. If you’ve been using your containers you should be able to eyeball the portion amounts. Do know that most restaurant portions are way more than you need. Which means you’ll get to have leftovers for another meal! The weekly menu is a word doc so you can download and make changes to suit your needs. Just click on the image below to download, edit and print. 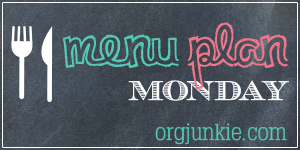 I’ve included the regular menu format and the Transform: 20 Meal Plan Template.